Ho Chi Minh City, Vietnam will always be one of my homes. I’ve had over a thousand meals there so you’re asking the impossible to give a curated list of recommendations. But if I must, I’ve listed twelve great places that I frequented for food. They were recommended by my local friends so these places all have the stamp of approval for authenticity. Most of these are in the city center so they’re easily accessible. If you haven’t already, read this article on my top 10 foods that you must try in Vietnam. When you’re finished, come back here for twelve locations around the city that’ll get you these great meals. This place is famous for the banh xeo, sizzling savory pancakes. I always got the mixed seafood ones and ordered a side of banh khot, which are these crispy mini pancakes. They’ll give you a giant plate of broad leafy vegetables to wrap the pancakes and you can dip them in nuoc mam, which is Vietnamese fish sauce. They also make great smoothies and freshly squeezed juice. If you like ice cream, this place is for you. Don’t complain to me if you get fat from going everyday. This cozy alley specializes in longan ice cream and is popular among both locals and foreigners. They give you a generous scoop and top it with fresh longans and salted peanuts. They have other flavors such as coffee, vanilla, durian and coconut but most would argue that longan is the best. For a hot and humid city like HCMC, a scoop of amazing longan ice cream is unbeatable. Who is up for amazing spring rolls? This place is home to the best seafood spring rolls in HCMC. You should order their signature fried seafood spring rolls with a side of bun, which are cold rice noodles. 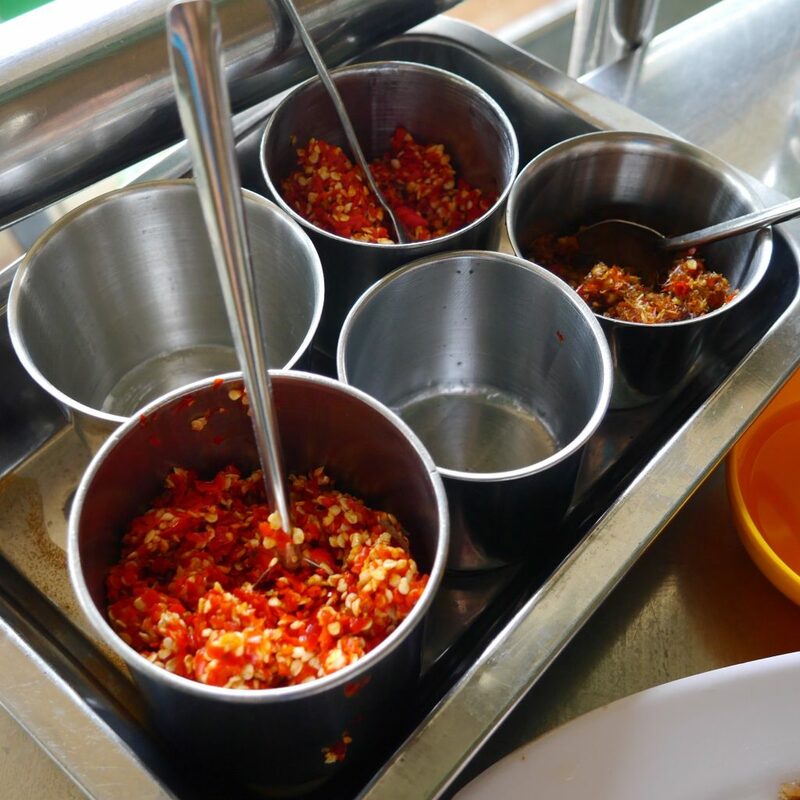 They’ll give you a variety of fresh vegetables, nuoc mam and freshly pressed chili. It’s similar to having bun cha from Ha Noi, which you’ll see later. When the spring rolls come out, you’ll be surprised at the size of them but don’t worry, they will cut it up into four pieces. I like their fresh juices too so be sure you try them as well. This place is, hands down, the best banh mi shop in HCMC. This banh mi is not for the shy. It is packed, I mean PACKED, with a variety delicious sliced meats, shredded dried pork, pickled vegetables and some amazing sauces. If you’re up for it, I highly recommend this place. You won’t regret it, I promise. Pho is obviously Vietnam’s national dish. The wonderful thing about visiting HCMC is that each and every pho kitchen makes something different. You’ll be able to try all kinds of pho. I recommend this place in particular because they make phenomenal chicken noodle soup with the clear, glass noodles called mien. I believe it is run by a family that has been in the business for a long time so they know exactly what they are doing. If you notice, most places to eat in HCMC specialize in a particular dish or a region. If you’re looking for something that covers almost everything, this place is popular among tourists. When I say that to most people, they become hesitant because they only want the local experience. However, their food is delicious and very authentic. Their menu has a lot of choices and the service is great. You can’t go wrong with that. I always took my out-of-town friends here because this restaurant makes the experience of wrapping your own spring rolls so fun. When you sit down, you choose the types of meat you want. The servers will bring out the rest. You’ll get a side of rice paper (the kinds that you don’t need to soften with water), several dipping sauces, pickled vegetables, freshly pressed chili and a lot of vegetables. Try a variety of combinations and mix up those sauces. You won’t realize how full you are until you literally can’t move. I’ve had many bowls of pho while living in HCMC. I can’t recall what each and every place did and how they tasted like but I remember this place was one of my favorites. I can’t put my finger on it but the broth was flavorful and the variety of meats in my soup was great. It was always my default post-lesson lunch meal. That delicious broth going down my throat after disciplining children all morning was the best feeling. Having great pho in HCMC also feels like time slows down in a hectic city. If you want a comforting bowl of pho, look no further. Bun cha is a dish that is actually native to Ha Noi in Northern Vietnam. However, it doesn’t mean that HCMC’s version of it isn’t up to par. It’s actually just as good. This dish is a simple combination of cold rice noodles, fresh vegetables and grilled fatty pork with, you guessed it, a healthy amount of nuoc mam. The heart and soul of this dish is the grilled pork. It’s out of this world! They also make great spring rolls here so you can add those in as well. I was introduced to this place by a friend because I wanted to try good food from Hue, a city in Central Vietnam. I’ve been here numerous times and have ordered a variety of things from their menu and they’ve all been great. If you go here, none of their dishes will disappoint you. I am a huge fan of bun bo hue, which is a beef noodle soup with chili oil but you should try as much of the menu as you can. I’m such a sucker for great hot pot and this place nails it. You might be hesitant about eating hot pot in such a humid city but believe me, it’s absolutely worthwhile. The variety of seafood you get in these pots are unbelievable. They also give you vegetables and noodles you can cook in the pot and provide complimentary broth refills when you don’t have any left. Go here with a lot of people so you can fully immerse yourself in the hot pot experience. If you’re down for a challenge, go here. This place is popular for the dish, bun dau mam tom which is a platter with fried tofu, different meats, cold rice noodles and fresh vegetables. You mix these up and eat them with a special shrimp sauce, mam tom. It’s a thick, purplish-colored sauce that smells really good. You need to mix the sauce with some salt, pepper and lime juice and that’s how you get it to taste really good. You might not agree with me but you have to at least try. There are so many incredible places to eat in HCMC. If you’re going for a short trip, you’ll regret it because that’s not enough time to try all the great meals here. I was there for two and a half years and that wasn’t even enough. I’m not kidding you. Anyway, I hope this was a good list to start you off with some places to eat while you’re visiting this remarkable city. You can leave me a comment or email me and I can put you in touch with some great local friends who know more of the secrets of Saigon. You’ll tempt me to buy a trip back to HCMC but if that happens, I won’t be mad.